The history of cannabis is a fascinating journey through various international cultures, all of which have engaged with the drug in different ways. Acclaimed cartoonist Box Brown guides readers on that journey in his new nonfiction graphic novel from First Second, Cannabis: The Illegalization Of Weed In America. Brown travels from India to Mexico before settling into the United States to explore how the government has used anti-marijuana legislation as a tool to oppress marginalized people. Brown’s historical graphic novels have alternated between introspective biographies (Andre The Giant: Life And Legend, Is This Guy For Real? The Unbelievable Andy Kaufman) and more macro examinations of cultural touchstones (Tetris: The Games People Play), with Cannabis falling into the later camp as it looks at how this medicinal herb was demonized by lawmakers looking for ways to keep power in the hands of white men. It’s a riveting story that speaks directly to our current cultural moment, and Brown’s visual style imbues the graphic essay with personality that pulls the reader deeper into the narrative. This exclusive preview of Cannabis: The Illegalization Of Weed In America, on sale April 2, explores how the plant became a social drug in Mexico, gaining the ire of the Catholic church. These pages spotlight how Brown incorporates humor into his storytelling, particularly in how he depicts people being anxious about their cannabis use around clergymen. This excerpt is a great example of how much information Brown packs into his comics without making them feel overly dense. Specifically, these pages reveal how religion fueled negative opinions of cannabis, the origin of the drug being called “marijuana,” the ways it first entered the United States, and the role the Mexican Revolution played in weed’s U.S. expansion. 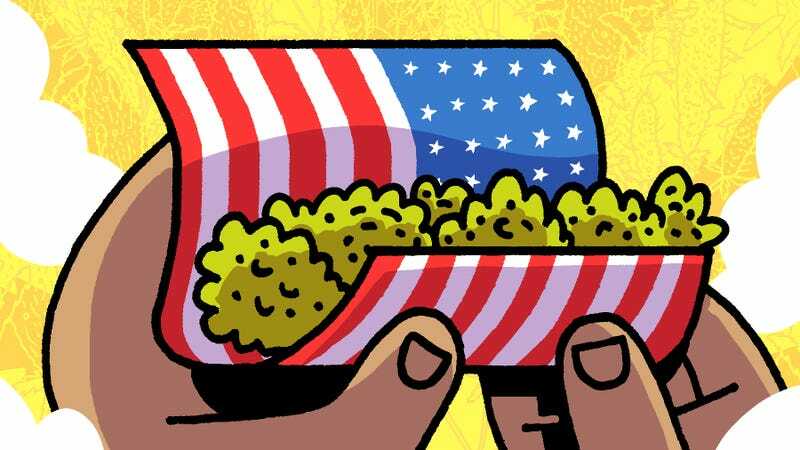 Whether you’re a weed enthusiast or a U.S. history buff, there’s a lot to take away from Cannabis, which says a lot about institutionalized racism and ongoing class struggles through its examination of a little green plant with a big socio-political impact.